Do you remember my new chairs for the office that I showed you last week? I was pretty much at a standstill in this room until I ran across them. Click HERE to see more. Well…that was only one side of the room. The other side of the room is a whole ‘nother story. See that big ole blank wall? That’s just one of my problems. I can’t figure out what kind of art to put on it. One large piece? Several large pieces? Or a gallery wall? Would a gallery wall be too busy right beside those bookcases? I keep thinking that I’d love to find a ginormous vintage looking map to cut into four pieces and place in frames in a group, but I can’t find one. Another question is what to do with my bookcases, if anything. Paint them? Back them with a patterned paper? I’m happy with the way that they’re arranged, but I just can’t decide if they need something more. Keep in mind that the you look straight at these from the foyer. And then there’s this. Looking from the dining room into the office, you get to look at our lovely printer, shredder and wires that go with it all. Oh yeah – and another blank wall. In some ways, I feel like the office is a sea of brown – floors, desk, bookcases and part of the chest holding the printer – with some black accents thrown in – the lateral file cabinet between the chairs (see the photo at the top). Do I need an area rug to break all of the brown up or would it be too busy? The room is only 11’x15′, so not very big. Should I just paint something, but what and what color? I’m pretty sure that Pookie wouldn’t be too happy if I painted the desk. Plus it gets a lot of use and would get scuffed up pretty quickly. So what say you? Can you help a girl out? I’d love to hear your suggestions! Hi Kristen. I like the idea of splitting the bookcases up and actually thought about that when we moved in. The problem is that the room is only 11.5′ wide and it was too crowded. :/ I love the idea of a map too, but I can’t find one that I like that doesn’t cost a fortune. Isn’t that always the case when you’re looking for something specific? lol I love your idea of adding some plants – hadn’t thought of that one! I love the idea of cutting a big map into it sections. Instead of framing, have you considered wrapping the pieces around canvas frames? Love this room so far! The idea of a map is terrific too…my hubby and I love old clocks and probably have too many but I think a nice clock above the printer would look good and would draw your eye so you wouldn’t notice the printer so much. Like the last writer I think some greenery and a carpet would soften some of the brown. I wouldn’t paint any of the wood but that’s just me. I have added fabric, wallpaper or wrapping paper to the backs of my cabinets as a temporary spot of color and pattern. I find it lets me quickly and easily change a rooms vibe without a Hugh commitment! I’m also moving and doing a whole house with a lighter look…I think sometimes it just gets to be too much to try to finish a space and that I need to leave it alone for a while and then the perfect solution presents itself…I’m positive it will wind up being a great room eventually as you have wonderful taste! Hi Amy. You’re right – a clock would look great on that wall! That’s so funny that you said that about leaving a space alone for a while – that’s exactly what I’ve experienced in this house. Thank you for all of your suggestions! Definitely a rug. Maybe in a faded red for color, or a cream and gray to blend with whatever artwork you decide on. And I wonder if you’re able to float the desk in front of the windows – switching the desk placement and the chair groupings. Then you won’t have such a huge blank space to fill on that wall. And I love the idea of old maps framed on that wall! Hi Stephanie. I love the idea of a rug – just not sure if it would interfere with rolling the desk chair around or not – maybe a nice thin one would work. That’s a great idea to flip the furniture arrangement, but I don’t know if I could bare having my back to the windows! I watched several deer cross our yard while sitting at the desk the other day. I can’t think of anything that I’d like better on that wall than some framed map prints, I just can’t find one that I like that is also affordable! I would be tempted to paint the bookshelves white then you can put something on the wall without feeling like everything together makes it overwhelming. Leave the desk, but possibly add a rug, depending on what you look at for wall decor. Hi Celsey. Hmmm…that’s a very good point about painting the shelves. I think that you’re right – it wouldn’t seem to compete with whatever is on that wall. Thank you for your suggestions! Have fun! You’re doing great! Hi Richella. I would LOVE to avoid painting those bookcases if at all possible – not a job that I would enjoy. Love your mirror gallery wall! It sure would help to bounce some additional light around this dark’ish room. Most everyone is recommending a rug, so I guess I should look for one. Thank you for your input! 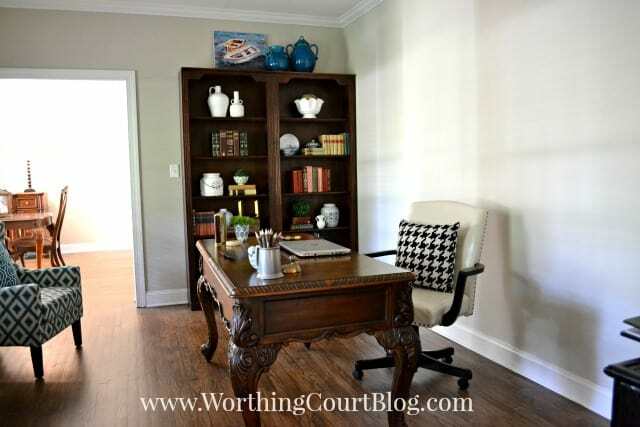 how about a soft colored oriental rug with blues to continue your blue accents and keep the traditional look of the desk, later wainscot and/or chair rail on wall behind desk for texture maybe. Big mirror to reflect light or maps behind desk great idea. Cord wraps are cheap and bundle insightly tech cords, or a plant placed there can help also and add freshness. Only thing bothers me, in my own opinion, is the black and white pillow on desk chair. In picture it looks too stark, especially since your other pillows are teal/blue…..
You are really creating a lovely home. Thanks for sharing! Hi Jae. It sounds like a rug may be the way to go in this space. I just need to find a thin one that won’t interfere with the rolling desk chair. I would love to add some wainscot to this wall! That’s always been on my list, but it’s probably a project for down the road. Your idea of placing a plant to help conceal the cords is a great one! The black and white pillow doesn’t live in that room. I just stuck it there to give the chair a little definition because it is cream colored and tends to blend into the wall in photos. 😀 Thank you for your suggestions! Home offices are the biggest challenge because they are personal spaces and so much important time is spent there. 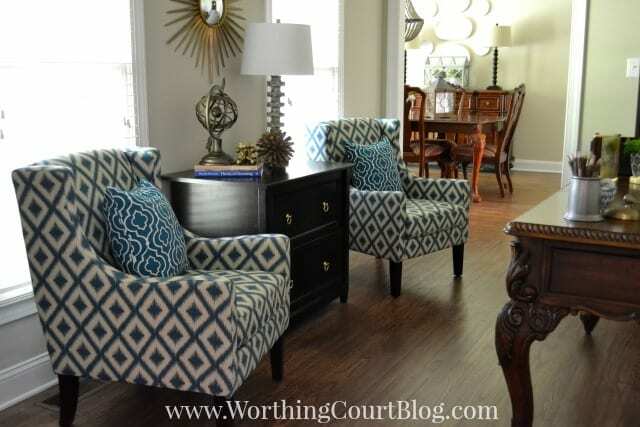 You have some great elements, so far, Suzy, and I see a real need for more trim work….wainscoting, judges paneling, or even just a chair rail would dress it up a bit without getting too formal. A natural fiber rug or a patterned rug is needed. Definitely divide the bookcases because you can’t center them on their current wall, anyway because of the light switch. And, yes, paint them. One more project….! I love the wood but they are very heavy for the room. I love the chairs! Great color and pattern. I would move the printer to the wall where the bookcases now live, place it on a table and cover the cords as previously described by another reader. It won’t be seen from the dining room. Hang art or shelves above. Have you considered placing the desk at an angle? I would be curious to try that just to see how it fit. Thank you for a lovely blog. I look forward to it each day. Blessings! Have fun with it! Hi Mary. One of my problems with this room is the size of it – it’s only 11.5′ wide. I do love the idea of splitting up the bookcases, but it makes it too crowded. :/ For that same reason, I don’t think the desk would work on an angle (but you’re right – it sure would add some interest). 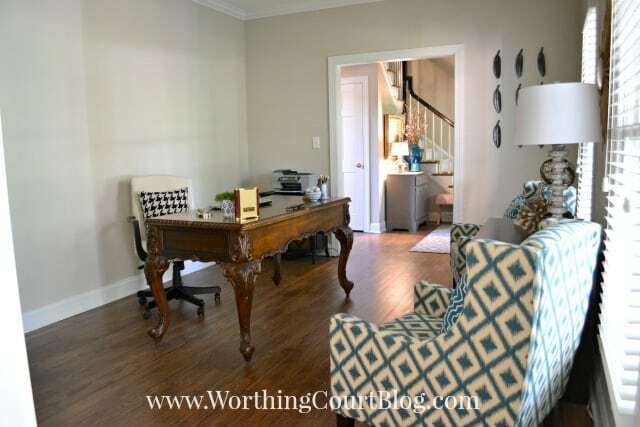 I’ve always wanted to add some wainscoting on that wall and hope to get to that project one of these days! You’re right about the bookcases – they are a bit heavy looking. I dread the thought of painting them though – wonder if adding something to the back of them would lighten them up enough. Love the idea of some shelves above the printer table! Most everyone is suggesting a rug, so I need to be on the lookout for a thin one that won’t interfere with the rolling desk chair. Thank you for all of your suggestions and your sweet comments! I love the progression of your office. I would also recommend placing an area rug, preferably under the desk (a gorgeous piece) so it stands out more from the floor and place a coordinating pillow on the desk chair similar to ones on the other two chairs. You need some of the gold color in accents and/or accessories near the printer to keep it flowing around the room. If you want to lighten something up I agree with lining the backs of the bookshelves with a paper that is easily removable if you don’t like it or your colors change. I LOVE the map idea and Kristen mentioned going to a copy store and getting them to create the size you want and having it cut into the four parts. That’s a great idea! Love your decorating and blog. Have faith in your vision, it will be beautiful. Hi Jann. That’s a good idea to bring some gold accents to that side of the room. Maybe with a frame or something. I do think that I’m leaning toward lining the back of the bookcases with something for exactly the reason that you mentioned. Thank you for taking the time to help me out! Your bookcases are so nicely arranged. It would have taken me hours and lots of trial and error and then may have missed the mark. It would be fun to add a simple pattern to the back of the shelves. Perhaps with some color that would pick up the chairs. As others have said, a pretty rug will be a great asset to your room and that would probably be my first priority. You may possibly consider buying a piece of furniture to house your printer,etc. One formerly used for a TV would work and you could paint it if you desire. Your desk is so pretty and I would never consider touching it with paint! Hi Connie. It took me quite a while (several days) to get the bookcases just right – lots of trial and error just like you said. I have to be in the right frame of mind to arrange bookcases and I make a huge mess when I do because I drag out so much stuff to try! I think that a piece of furniture for the printer is going to be the way to go and one that housed a tv is a great idea because it would probably allow me to hide it. Glad you agree with me about the desk. Thank you for all of your suggestions! I love the new chairs and lateral file! I agree that an area rug would soften the room and break up all of the brown. 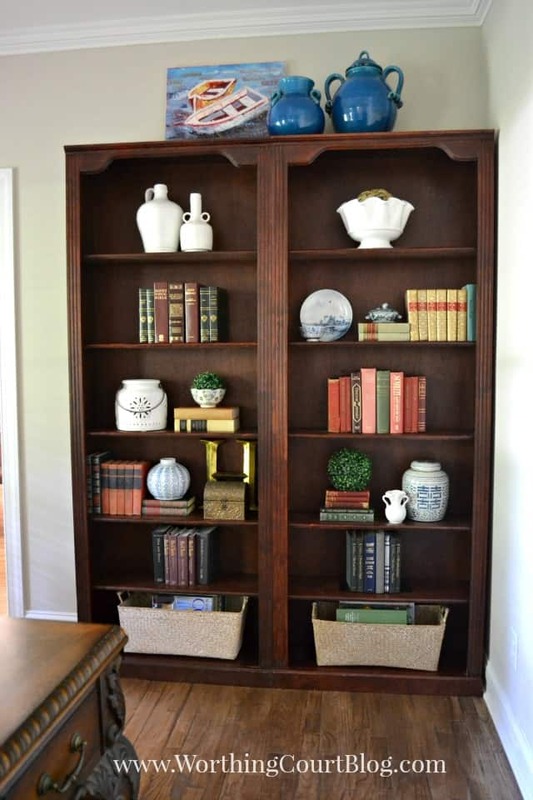 Have you considered breaking up the bookcases and moving them to the opposite wall? Maybe paint, or not? Then a wider piece for the printer, etc. where the bookcases were. A nice piece of art (or giant clock) over it. I think your idea of large maps on the big wall sounds perfect. But a gallery wall would be nice too, maybe fewer, larger pieces rather than small ones wouldn’t look too busy. You have a great eye so I’m sure whatever you choose will be great. Can’t wait to see what you come up with. Hi Cathy. I would love to break the bookcases apart – it sure would help to fill up that big blank wall. The problem is that the room isn’t very wide and having the bookcases on either side of the desk is too crowded. :/ I love the idea of a large clock! Thank you for all of your suggestions! I actually meant the wall with the opening to the foyer. Not sure if there’s enough room there, it’s so hard to judge from pictures. I would not paint the desk – it is gorgeous as is. You are doing such a good job, I think it will come to you. For me, I would do a gallery of botanicals. Thanks for a lovely party. Hi Madonna. Glad you agree with me about the desk! I love it just the way it is too. I hadn’t even thought about a gallery of botanicals, but that’s a great idea! I think the room really is lovely and the window side of the room is perfection. I have to disagree with many of the other commenters, I don’t think you need a rug. I think it would be hard to find the right size for the furniture placement in the room. What the room does need is a a tall tropical type plant in the corner by the printer in a blue and white planter on a planter. Maybe even a tree some Ivey planted at its base. The printer table needs to be replaced with something more substantial (maybe taller) that has doors to hid the printer. I am not saying to go out and buy something but maybe shop the other rooms in your house. Most importantly I think once you have some artwork on that wall behind the desk, the room will feel more finished. It would also be nice to flank your artwork with a pair of sconces for additional lighting. Lighting can completely change a room and if sconces are cost prohibitive maybe an upright in the plant I suggested and a floor lamp . Maybe a painting type light attached to your bookcases. The room is so close to perfection it just needs the jewelry to be ready to go! I just painted my dark oak shelving unit in my living room an off white color and it turned out amazing. They do blend into the wall better and it is a huge improvement. Your desk would pop more and become more of a focal point. If you would like see my before and after pics, just email me! It softened the room considerably. I think the elephant in your room are the bookcases. After reading all the comments there were 2 common comments, one being the bookcases. I think you should rethink them. Are they necessary. In photo it seems they are just display and no function and they are bugging you. You state room is too small to break them up. How about deleting them or turn them in their side and stack them. I recently painted my shelves in the living room. They were also a dark wood. I painted them an off white and they look so much better. I think if you painted yours an off white your desk would pop more and become a focal point. I don’t think you would regret painting them. Add a neutral indoor/ outdoor area rug and it will all start coming together. I would keep the shelves, I think they add interest and you will probably want to redecorate them again, which is so fun once they are a lighter color! I love the chairs you found for the home office! I think an area rug would look nice in there as well as soften the look a bit. I like the bookcases, but I think a paper backing of some sort, would change them up a bit and make the look more cohesive. As for the huge wall, I like the map idea, but I also think a gallery wall would look good, too! I love plants, so if you have a “green thumb”, I think plants would look good in the space, too. I’m a big fan of your blog and can’t wait to see what you come up with to complete the space! 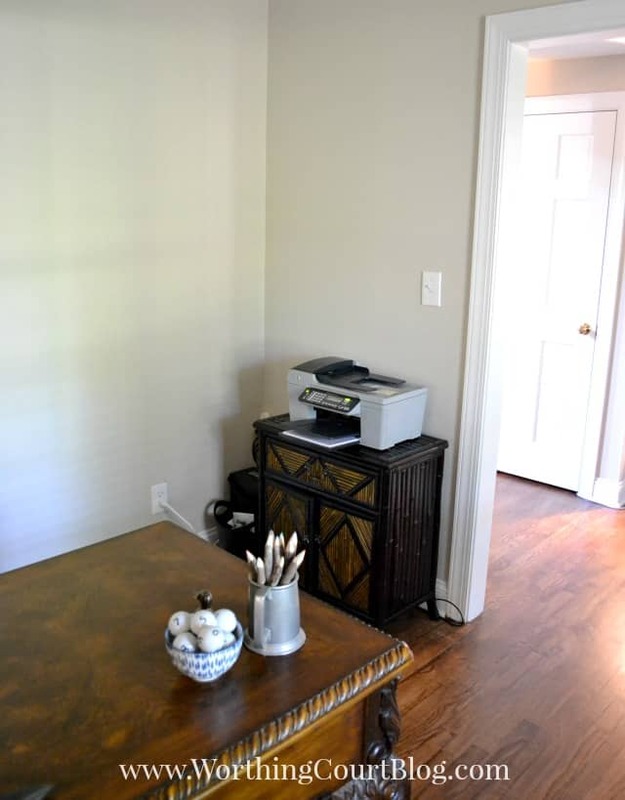 I would either paint the wall behind the desk, as well as behind the bookcases & printer wall, a color you’d want to feature or what about wallpaper? I know it’s scary to think of wallpaper but it is still popular. With a pattern wallpaper, perhaps a mirror behind the desk would be enough. Maybe a gray & white large pattern since you have gray chairs? Whatever you do, I am sure you will think of just the perfect idea. Your decorating skills are fabulous!